Originally from Silver Spring, MD Barton and his family frequented the popular Maryland and Delaware beaches for family vacations. For the past 7 years, he has assisted buyers and sellers in achieving superior results for all their Real Estate needs. Barton specializes in the coastal areas of both MD and DE. He finds his greatest joy in working with clients to make a home at the beach not just a dream but a reality. 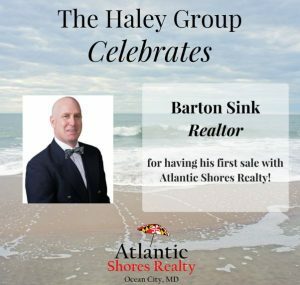 The Haley Group Atlantic Shores Realty congratulates Barton and looks forward to all his future successes!